Different than what I'd planned on posting today, that is. Since that means I'll now have to find the time to re-scan all that stuff, I figured I'd post something useful in the interim. To that end, here's a character sheet for the latest edition of a truly old-school game - and no, I'm not talking about 4E! 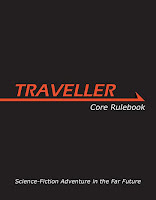 I'm referring to Mongoose's version of the Traveller game system. Even later (as in a couple of years ago) I ran a "Classic" Traveller ("CT") game set in the universe of Gene Roddenberry's Andromeda that quickly fizzled out. Honestly, I like the idea of the game - a lot. I just seem to have trouble finding an edition that really hits the sweet spot for me. Well, make that had trouble. Thanks to Mongoose's newest edition, I think my Traveller woes may be over. 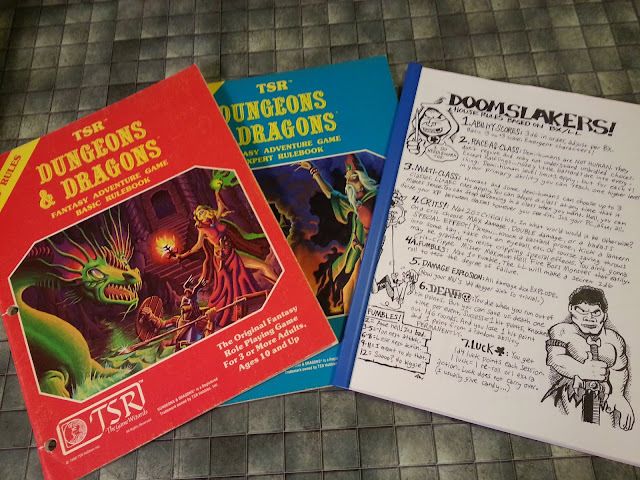 I picked up the core rulebook for a song on eBay (almost half of what I'd have paid for it at Amazon) and spent some quality time with it a few nights ago. Boy, was I impressed. The newest edition seems to preserve much of the simplicity and charm that I so loved in the first three CT "LBB's," but added the depth and robustness I liked from the later editions. After a first read, it looks like this edition has included everything I liked about the previous editions and excluded everything I disliked. So now I find myself ramping up for a campaign in the Third Imperium, and really looking forward to it. I've finally got an edition that hits all the right notes for me - let's just hope it goes over well with the players! 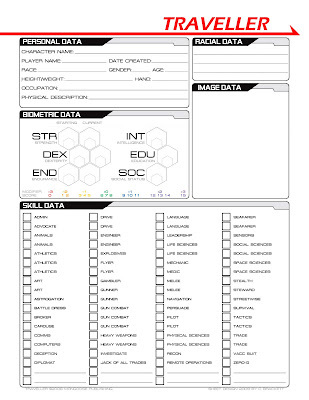 I am happy that you finally has found a Traveller version You like and that you have made such a good looking character sheet. Really nice sheet. I was never that into Trav either, but I like this Mongoose version, too. What, no six-digit hex-string to represent your character stats? "Hi, I'm Sir Rory Akimasi, 799A7B"
Glad you guys like the sheet. You'll get "No Reply At All" from me! Genesis has a sidekick, Steve Miller, ABACAD. That's one of the better ones I've seen.